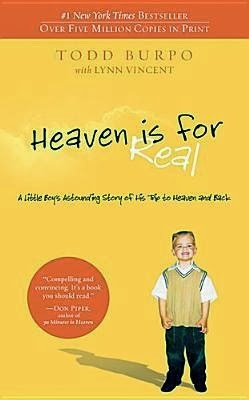 I'm reading "Heaven is for Real" right now, and it feels sacreligious to say I'm a little disappointed in it. While it's amazing and exciting that this 4 year old kid went to Heaven and met Jesus and many of his dead relatives, it doesn't answer the questions I have about the afterlife and how we'll be sorted out in Heaven. Since the boys were diagnosed with Fragile X Syndrome almost eights years ago, I've learned and thought a lot about the brain and how its functioning effects our very personalities, and our ability to relate to and love and influence each other. A complication or an error in the physical makeup of our brains can almost completely change who we are. I say "almost" because I know that people with intellectual disabilities are people we can relate to and love; but because they don't talk, listen, think, or behave like we expect them to, it can be a lot harder to see the person behind the disability. In the book the author talks about how close he was to his grandfather who mostly raised him, since his father had bipolar disorder and was unable to raise him. Then when his son has surgery and nearly dies, he sees his dad's grandfather in Heaven and has an extended visit and a meaningful experience with him. The father isn't mentioned again. So, because his father had this brain disorder that rendered him unable to associate with his own son, he's not in Heaven with the rest of his family? Or maybe he's there, but he's not bothering to meet with new arrivals because they didn't really get to know him in their earthly lives? There's a lot of stories about how people look in Heaven; how physical disabilities drop away. How we will be free from the limitations of our earthly bodies. Intellectual disabilities are physical, too. Do they drop away? In the book the little boy mentions that no one in Heaven wears glasses. I recently saw a picture on Facebook depicting a child abandoning a wheelchair and walking off into the distance, hand in hand with Jesus. The wheelchair makes a great visual symbol of leaving behind physical limitations. Will it be the same with brain limitations? I know that I need to have a conversation with a pastor or priest about this, but haven't yet had the opportunity. Hopefully one day I'll get some answers.